In today’s post, I’ll be sharing my thoughts on the Eden Extra Whitening Apricot face and body scrub that I’ve been using and has a become a staple in my skin care routine. 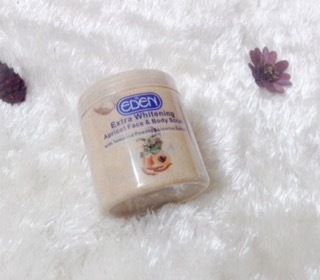 The Eden face and body scrub has 2 types: the whitening/lightening one and the plain one. I’ll be reviewing the lightening one in this post. Eden Extra Whitening Apricot Face & Body Scrub is a deep cleansing face and body scrub with natural sources of ingredient to quickly remove blackheads, impurities, unclog pores, dry, dead skin cells from the surface of your skin and reveal a smooth fresh layer. 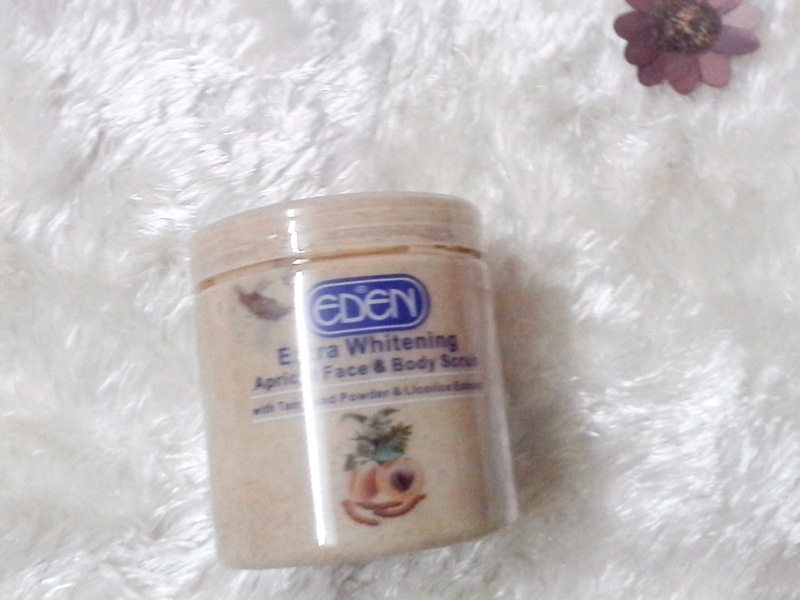 Eden Extra Whitening Apricot Face & Body Scrub contains natural Tamarind powder and Licorice extract to improve the skin whitening, leaving the skin soft and subtle. It is suitable for all skin types. Apply unto moist skin, face and body. Gently massage to remove blackheads and dead cells, especially more concentrate on dry skin areas such as elbows and knees. Rinse thoroughly with water. Avoid contact with eyes. This scrub comes in a transparent container with the usual screw lid. It has a beige/brown colour and feels like a lotion. Upon application, it dries as mud-coloured micropebbles on the skin. I like that it isn’t too harsh on the skin, unlike some other scrubs I’ve used that are almost painful. It leaves my skin really soft after using it without drying it out. I’ve been using it for some months and I can say it has no lightening/whitening effect..*lol*..it helps fade hyperpigmentation a little but I don’t think this scrub will not make you lighter. I also noticed my skin absorbs other products faster after I’ve used this. What I don’t like: It worsens my itching..(read more about this here). The itching is worse when freshly applied. It gets bearable after a while, but it’s still not pleasant. Asides the itching, I like this scrub a lot. It makes my skin feel softer and look younger. I’d recommend to anyone wishing to try out an affordable scrub. It would be a good buy! •Don’t forget to SUBSCRIBE/FOLLOW in the box below, so you can get updates on all my posts via email! Great review, sorry about the itching though. I use the plain one because I was skeptical about this one lightening my skin lol, I use it once in a while and yes I can affirm everything you outlined. It’s handy, big and readily available. Thanks a lot, darling..I try to manage with the itching though..
Wooow, it’s dis itching part that is making me scared. It really depends on your skin type. My sister didn’t itch when she used it though. So over the years I have been using the normal Eden Apricot scrub, until earlier this year (2018) I decided to switch unto the extra whitening something and it’s really been good on my skin as well as the normal one, didn’t see any whitening effect though😁so recently my scrub finished and based on my Schedules of late I have not been able to hit the super market, but then my hubby called while I was at the office that I was at the super market and he asked if there is anything I would like, with a satisfactory grin I happily said my scrub, he did got it for me, but I noticed some differences as was doubting if it’s original, becomes beneath the area which there’s supposed to Ingredient. It wasn’t right directly on the body of the scrub rather it was written on a white paper and was plastered on the Can, secondly when I used it it was so harsh like it contain sharp sand wasn’t gentle at all and doesn’t dry when applied to my moist skin, unlike the ones I have been using please… Help me bcoz right now am so scared of using it.